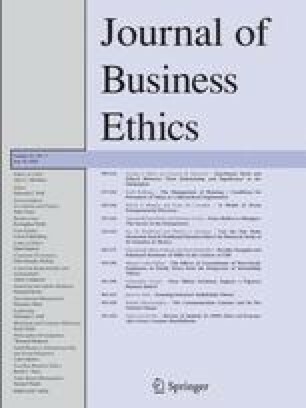 This paper compares the ethical standards reported by consumers and managers with different attachment styles (secure, preoccupied, fearful, or dismissing). We conducted two studies of consumer ethical beliefs and a third managerial survey. In Study 1, we used a questionnaire that we constructed, and in Study 2, we used the Muncy–Vitell Consumer Ethics Scale. The results in both the studies were consistent and showed that men reported a greater indifference to ethical transgressions than women. Based on the two studies, the results indicate that␣among male consumers, the dismissing participants reported the greatest overall indifference to ethical transgressions and the secure participants expressed the most ethical beliefs. The two intermediate groups did not differ significantly from each other. In Study 1, none of the women consumers reported a dismissing attachment style. Women with a secure style reported more ethical beliefs than those in the other two groups. However, the sample in Study 2 included dismissing women. The dismissing women reported the greatest overall indifference to ethical transgressions and the secure women expressed the most ethical beliefs. The illegal profit subscale described the most severe ethical transgressions, and for both men and women, the secure participants were less apt than the other participants to report a willingness to transgress. In Study 3, the Newstrom and Ruch (1975, MSU Business Topics, Winter, 31) Questionnaire was administered to 227 managers. All four attachment patterns were represented among the participants of both genders. In all cases, the participants with a dismissing attachment style showed the greatest readiness to transgress. This work was made possible by a grant from the American Association of University Women Educational Foundation that was awarded to the first author to support her postdoctoral work at Stanford University. The authors wish to thank Bulent Turan, Lynne Henderson, Daniel Leising, Kelly Wilson, and Pavel Zolotsev for providing helpful discussions and suggestions. We also wish to thank two anonymous reviewers for their constructive comments.